With all this RAF-ness this year, I felt the poor old Fleet Air Arm was being bit neglected. So I decided to build a Corsair. Also - and the real reason - I bought the lovely new AFV Club kit (or several boxes thereof) and part of the pact I made with myself when I was entering my card details was that I would build at least one more of the many many F-Toys kits that I also own (before the AFV one was announced). 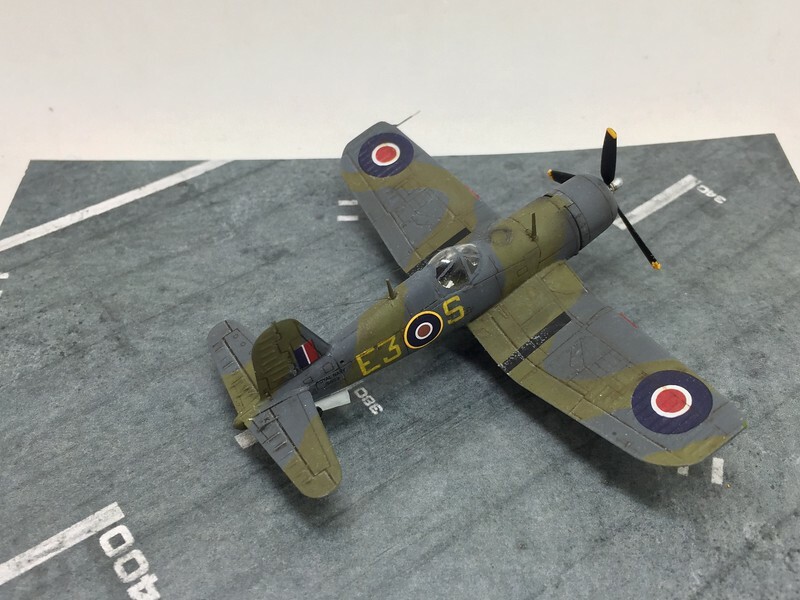 I previously built a Seafire MkIb using the F-Toys kit and some Printscale decals. 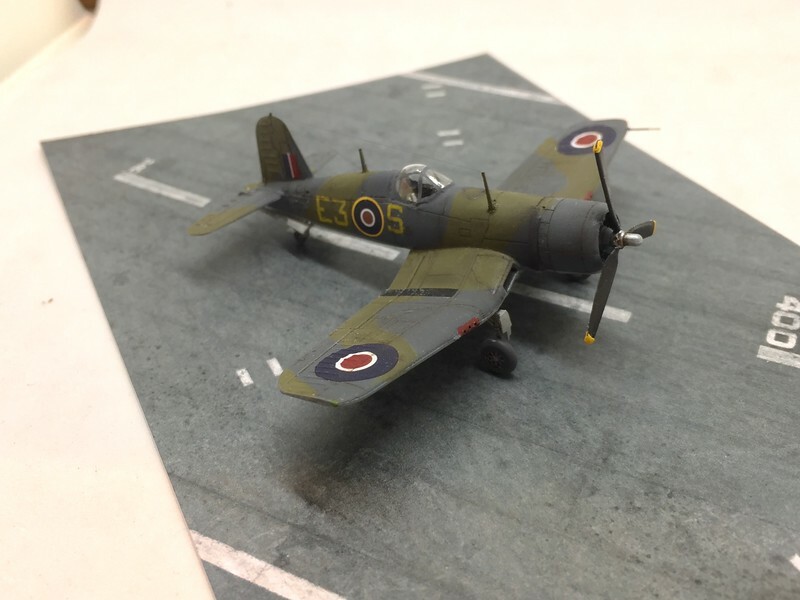 This was based with 731 Squadron at RNAS East Haven, which was a carrier conversion base where newly-winged pilots went to learn how to land without all that nice runway you have to play with usually. 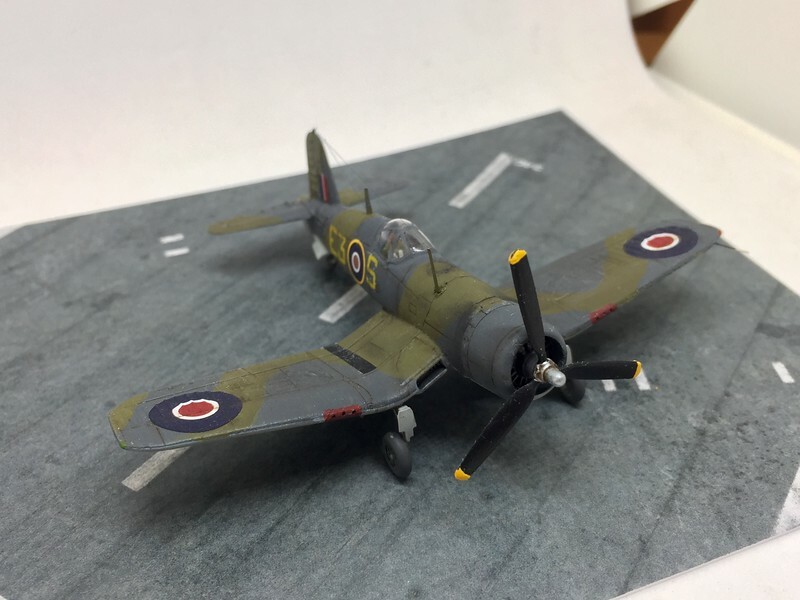 The F-Toys kit comes with decals for JS853, a 731 Squadron Vought Corsair (one of dodgy quality ones built by Brewster, no less) based at East Haven in July 1945. I was sold. - Most striking is the canopy - which is very ill-fitting and too narrow. The locating lugs at the sides also ruin any pretence at transparency. I smash-moulded a new one and this worked rather well actually. It's crystal clear and you get a pleasing eyeful of seat belts and instrument panel with a bit of gymnastics and cunning lighting. - The prop is terrible. The hub is very toylike and the blades are very oddly-shaped. I stole a prop from the AFV Corsair (it does come with two for a reason, I'm sure). - The fuselage sides are quite slab-sided rather than rounded (from some angles) but I confess I lacked the will to rectify this. It's not enormously noticeable. - All Mk.III and Mk.IV Corsairs had several inches removed from their wingtips. It too me a while to establish this. Essentially, if you are building a bird cage Corsair, you're fine (as the AFV Club Corsair is). These were based in the US for pilot conversions. 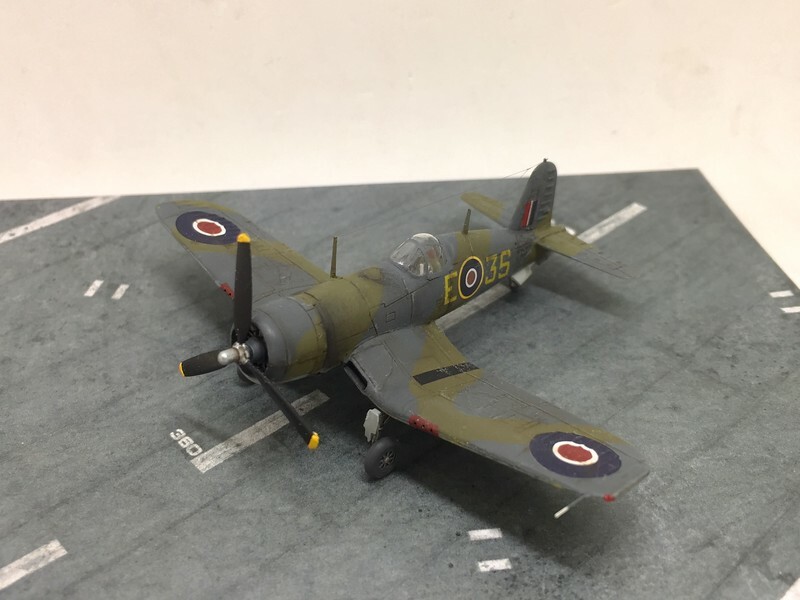 Only Corsair on models from Mk.III onwards were the wingtips reduced to allow the vast aircraft to fit on our diminutive carriers (interestingly, removing the tips increased the roll rate of the Corsair at low altitude noticeably - much like the clipped Spit - although it developed a tendency to wing drop when stalling - although this was later fixed with a slot on the leading edge). After much reading and slightly bored of squinting at black and white photos, I sanded an appropriate length off the wingtips. Otherwise the F-Toys Corsair is really ok. It has a lovely radial engine, the undercarriage are nicely detailed and it goes together without any real gaps at all. I don't think I used any filler. Some details are actually slightly better done than on the AFV kit, such as the tail-hook. As usual, I did a full repaint of the Gashopon. I used Hataka Extra Dark Sea Grey and some Vallejo Olive Drab (these were painted in the US in non-standard FAA colours). The F-Toys decals behaved fine, actually. 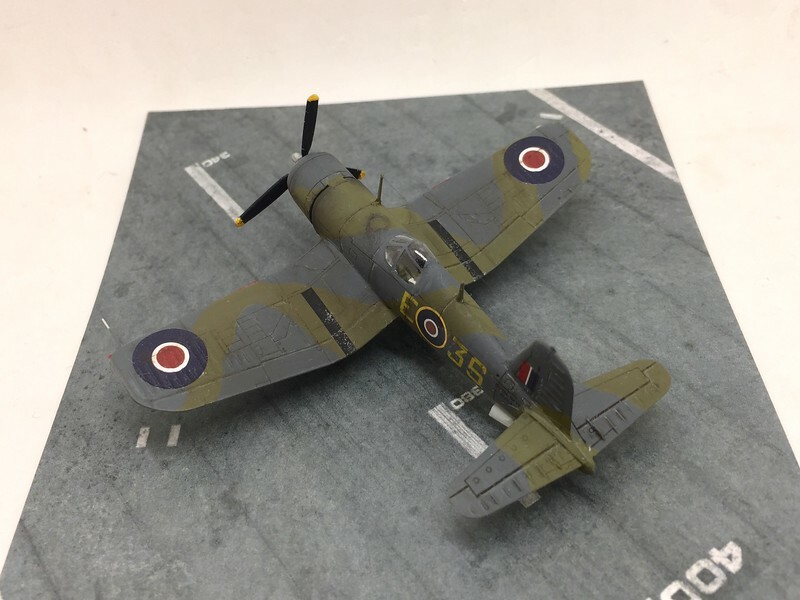 These really have improved enormously in recent years and responded very well to decal setting solution, particularly on the wings where I was worried all that somewhat overscale ribbing mess things up. I did some weathering, trying not to overdo it toooo much. I'm happy with it. 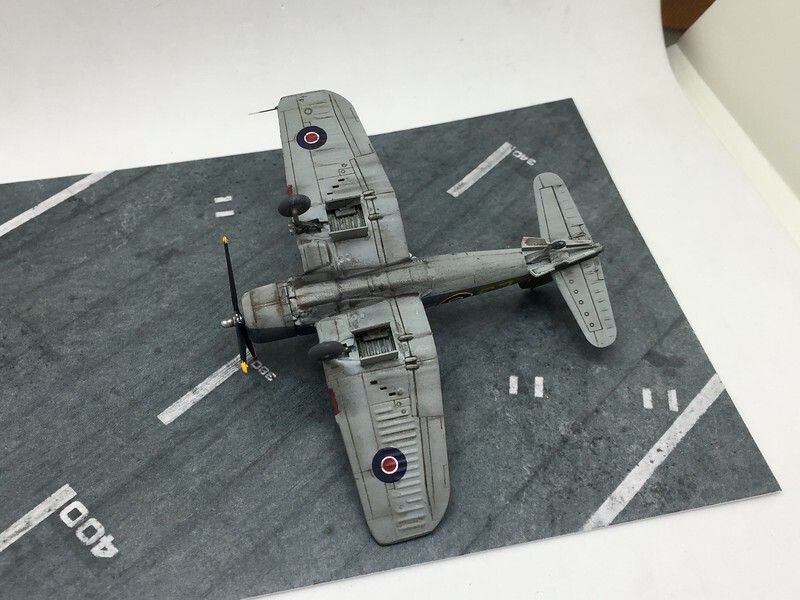 Video of 731 Squadron Corsairs shows them pretty beaten up. I had fun doing the underbelly. All in, a very satisfying build. It's nowhere in the same league as Woodstock's exquisite AFV Corsairs, but I'm happy with it. 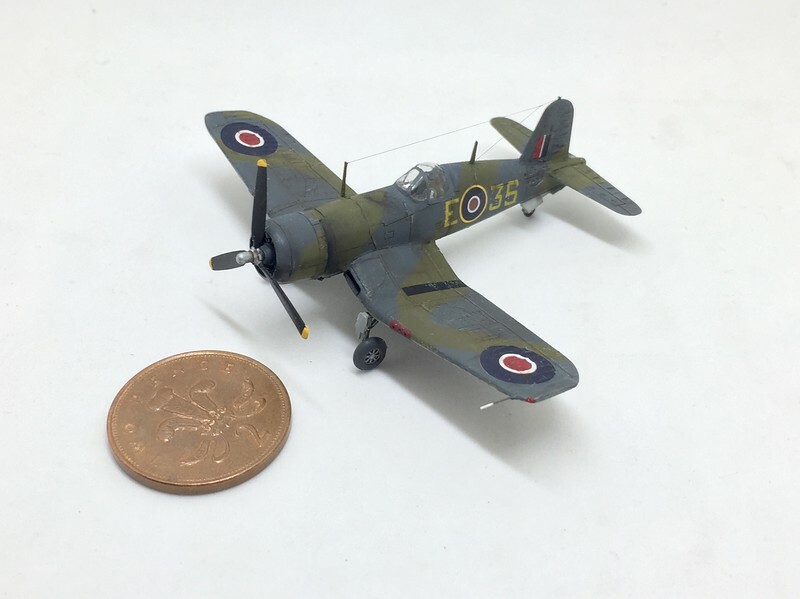 And it will look great next to a AFV birdcage Corsair Mk.I in similar colours. Thanks very much for looking, as ever! That certainly looks the business! And the modifications you have incorporated have definitely improved the final model. Another tick in the smash-moulded canopy column, too, people. And Peter, the configuration of the tail is correct. Checking blueprints, the row of circles appears on the upper surface of the port tailplane and the lower surface of the starboard tailplane, so F-Toys have it right. Not sure what the significance of these circles is though. I realise I the forum upgrade I never replied. Thank you! I was also confused by the tailplane details but came to the same conclusion as Smeg. It’s odd that they would get details like this correct and yet things like the prop, canopy etc are so glaringly incorrect or poor-fitting. Ah well. Another great one Angus. Thanks for the notes. I too have several F-Toys kits apart from those from AFV and I intend to build them all.... someday of course . Your weathering is amazing , how come this one isn't on the GB ? I guess because its Royal Navy, not Royal Air Force. Deserves a very honourable mention though.